My Sunday morning started off with scanning the Mint newspaper supplement. 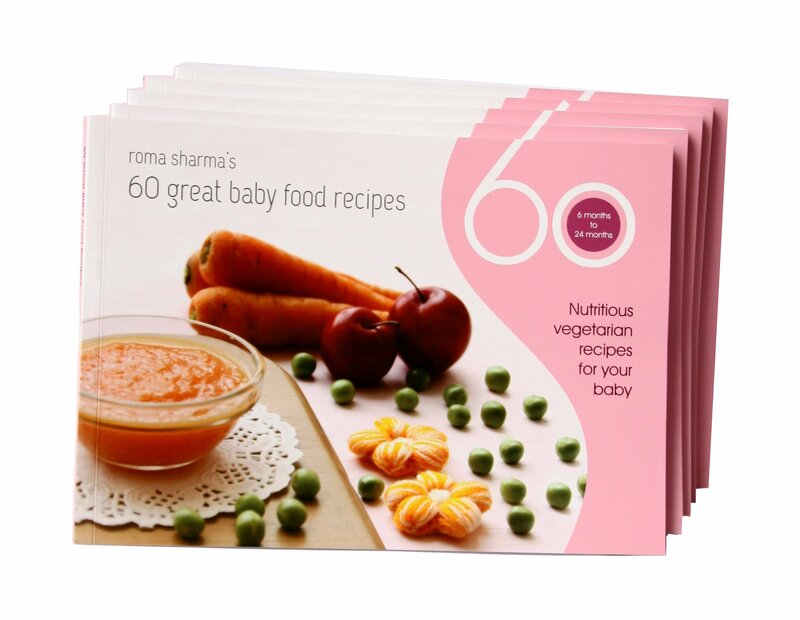 It was fully loaded with ideas for Diwali Gifts and some interesting recipes from Top Chefs. I particularly liked Tarla Dalal’s ideas for Low-Fat paneer and Khoya that can easily be made at home. 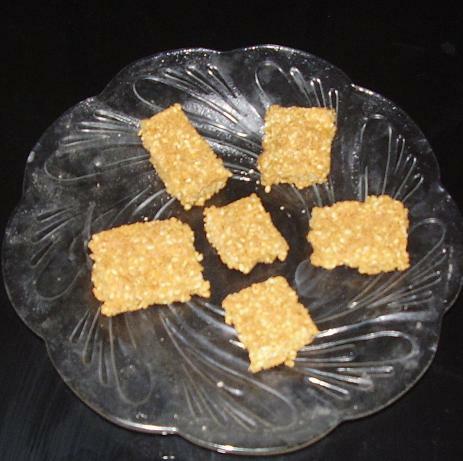 Low fat khoya is made by steamed a dough of skimmed milk and water. This dough is then mashed and flavored with sugar and essence of choice. I wanted to immediately put this idea into action but I didnt have enough skimmed milk so I used the badam milk powder that had been chilling in my fridge for way too long. 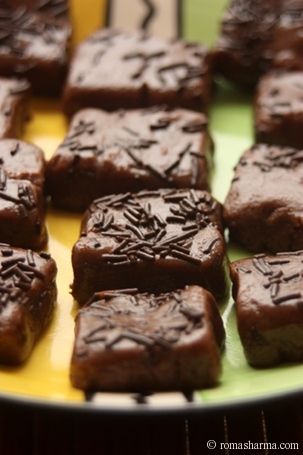 Gulgule can be made for traveling as they last a good one week. How difficult is it for a foodie like me to fast? Well, earlier it was tough but this year surprisingly I was able to do it well on the occasion of Karwa Chauth. Karwa Chauth is a festival where married women fast for their husband’s long life. They break their fast after worshiping the moon at night. For the pooja they dress up like brides with mehendi on hands, wedding saree, jewellery and all that glamor. My fast got over quite fast. I ate fruits and had milk although mostly girls in North do not even drink water. Incidentally, I had a friend show me some interesting recipe books, which I skillfully overlooked least I encourage my hunger pangs. All in all, the vrat (or fast) was no problem at all. My hubby keeps the fast along with me every year. The first year after marriage I told him not to, well he wouldnt listen. I made wheat vermicelli for breakfast and he went away without eating it. Thats 3 years ago and I still remember it like it was yesterday. Then on, I allowed him to fast with me. Its really nice actually to have company while fasting. 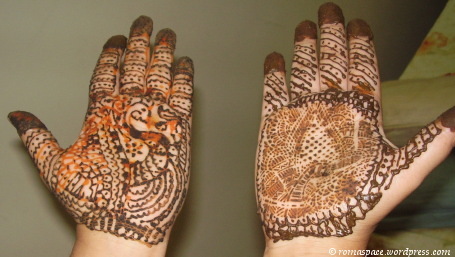 Despite my baby doll’s tantrums I managed to apply Mehendi on my hands a day before Karwa Chauth. It went on till late at night as usual but it feels great once you are done. I used my right hand to apply on my left and I used a stencil to apply on my right hand. Just place the stencil, apply the mehendi and peel off. Easy enough, what to you expect with one left hand after all? We went to my co-sisters place for pooja. The pooja got over on time but the moon hid behind the clouds, sort of making us realize its importance. After all, once a year we get so desperate to see it. Usually on Karwa Chauth its very cloudy so may be on Karwa Chauth we notice the clouds. This year was by far the toughest I must say. We waited for more than an hour and finally decided to worship the streak of light that we thought was the moon. As soon as we started the pooja the moon peeped out from a completely direction location. We immediately changed our direction and continued the pooja. Finally, it was time to have dinner. The prasad pooris were over even before we entered home. There is something about eating dinner after fasting all day. For one, the food tastes very good and the satvic style in which it is made makes it tastier. The prasad I make every year for Karwa Chauth is poori and Gulgule (sweet wheat flour dumplings). You can find the recipe here. 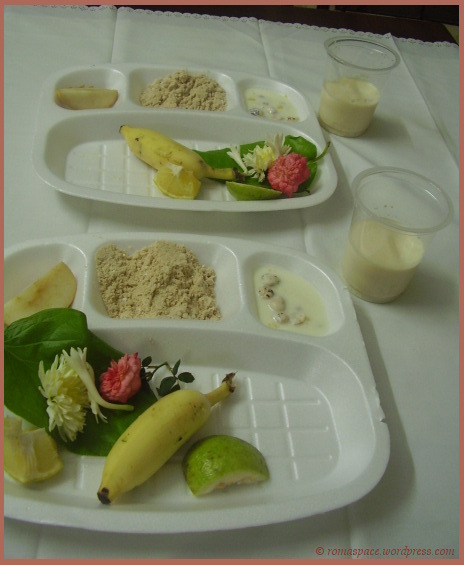 I would like to send this entry to Srivalli’s JFI Nov, ’08 – Festival Treats. Thanks for accepting my entry to the event, although its a bit different from the main festivals. 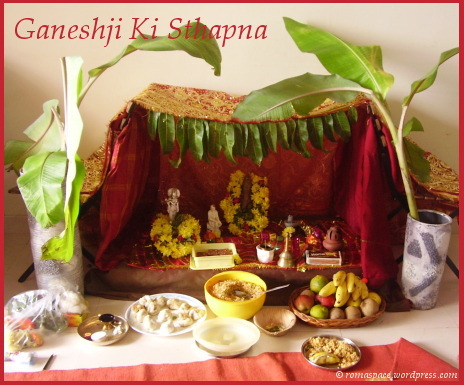 We keep Ganeshji Ki Sthapna for about 10 days and submerge the idol on Ekadashi (a day in the Hindi Calender). These 10 days we do pooja everyday. Sometimes when I’m busy I dont find the time to make the prasad in the morning. For such days, I have certain instant sweet mixes which can remain fresh for almost 2 weeks. Whenever I need to make prasad for pooja or if I want to offer laddus to unexpected guests 🙂 I just need to bind the mix and use it. 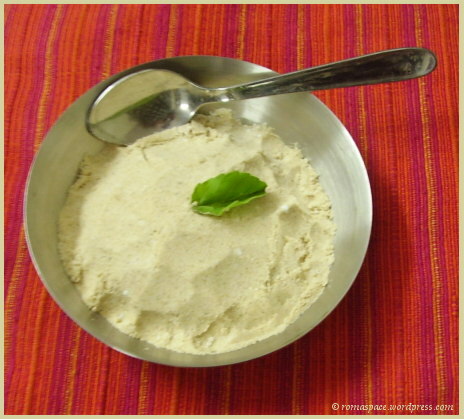 Some commonly used ingredients for making these kind of powders include rawa, roasted gram flour powder and groundnuts. Any of these can be used following the same procedure described below and can be stored for about 2 weeks in an air tight container without refrigeration. Here, I have used thin beaten rice which is a less commonly used base for laddu mixes. It however tastes good and the poha / beaten rice offers softness to the laddu. You can bind the powder with hot milk or ghee. Sugar can also be replaced with Jaggery. You can select the dry fruits you wish to add to your laddu mix. This is my entry to the Long Live the Shelf event that I’m hosting this month. 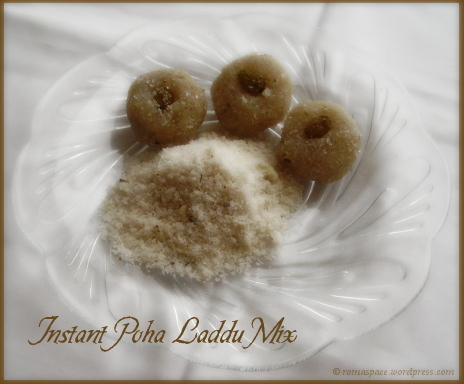 This instant poha laddu mix can be stored for 2 weeks in an air tight container without refrigeration. Also, sending this to the Original Recipe Event hosted by Lore of Culinarty. Dry roast the beaten rice till its crinkly. Place in a dry mixie jar. Dry roast the dry coconut powder for about a minute, stirring continuously. 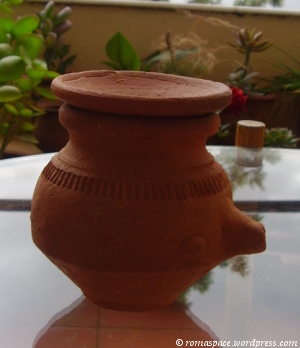 Place along with poha in the mixie jar. Now roast almonds and cardamom seeds and add to the other roasted ingredients. Once the contents of the mixie jar cool add sugar and grind the contents into a powder. 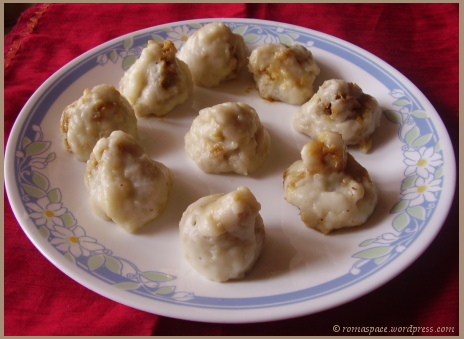 Whenever you need to prepare laddus just add hot milk / ghee to the powder and bind it. Dust the laddus with some more powder and garnish it with a raisin. You can fry raisins in the same ghee you heated for the binding. Its really easy for the thin poha and the dry coconut powder to get burnt. You need to stir them continuously. Please wait till the roasted ingredients completely cool off before adding sugar. While binding, add hot milk / ghee in small quantities else you might suddenly find the dough unmanageable. Festivals bring a change in environment that serves as a much needed break from the daily hussle bussle of life. A time to stop and celebrate life and to enrich ourselves by praying to the divine. You might have noticed that although there is a lot of work for almost 2-3 days before a festival you somehow dont seem to get tired. Its the devotion that gives us a whole lot of energy and gives us so much relaxation even amidst work. These 2 dishes together form the most important prasad we offer lord Krishna every year on Janamashtmi. Roast 1 cup of wheat flour in a thick bottom pan. Stir continuously to ensure it doesnt get burnt. When its almost done add 1/2 teaspoon of elaichi powder. Turn off the gas and transfer the roasted wheat flour into a plate to cool. Once its cooled off completely add less than 1/2 cup of ground sugar. Panjeeri can be made for traveling as it lasts for about 2-3 weeks. Just ensure the flour is roasted well for a longer shelf life. Charan in Hindi means feet and amrut means necter. Hence, Charanamrut here means the necter from the feet of the lord. 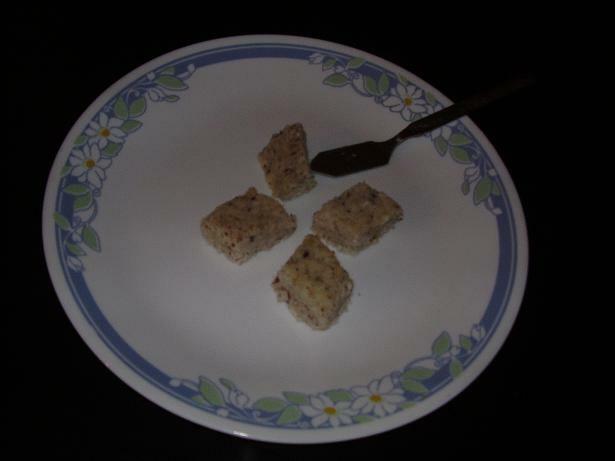 Its a mix of 5 ingredients and doesnt require cooking. This sacred necter is the first to be had after pooja, that means even before prasad. Mix 1 cup milk, 1.5 tablespoons curds, 1 tablespoon honey, any dry fruits (we use chironji), few roasted lotus seeds (options) and 1 teaspoon of ghee. Ganesh Chaturthi was possible in the same grand way we usually have it, thanks to Ganeshji for that. We actually returned from a 3-day long trip just 24 hrs before the festival. I was busy unpacking and getting the laundry done. However, on good occasions things just go on well. My husband surprised me by buying all the possible things I needed to make the occasion special. The next day I got busy making modaks , kheer and tamarind rice. We did pooja and really enjoyed the prasad. Somehow the tamarind rice we make all year doesnt taste as good as it does on Ganesh Chathuti. We worship the idol of Ganeshji for 10 days before submerging it in water. 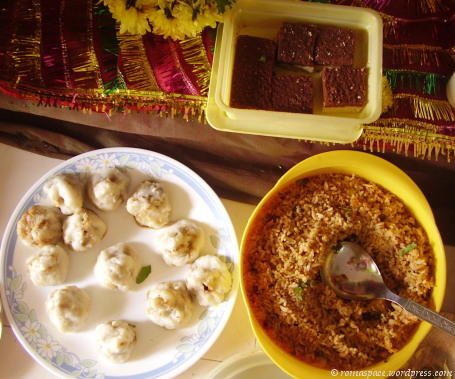 For prasadam I made tamarind rice and Ganeshji’s favorite modaks. Heat 2.5 cups of water. Once water boils add about 1 cup of rice flour. Cook till it thickens. Now cool this mix. Separately heat 1/2 cup jaggery with 1/2 cup grated coconut. Cook till mixture comes together. Flatten the rice dough with your palms and fill it with the coconut mixture. Seal in the shape of a modak. Steam modaks for 20 mins. This is my entry to the Krishna Janamashtmi and Ganesh Chaturthi event hosted by Purva’s Daawat. What I like so much about the event started on monthly festivals is that it allows us to know more about each others culture and traditions. We get a glimpse of how homes in different parts of India look on festive occasions. Our ways of celebrating the same festival differ every 1000 miles but the enthusiasm is shared across borders. Presenting two unique and delicious coconut burfi recipes. The first one is made with a sugar base and the second with a creamy thickened milk base. My personal favorite is the chilled coconut malai burfi, as it just melts in the mouth. Heat Ghee and fry the dry fruits like Badam, Kismis and kaju. Keep aside. In the same kadai fry freshly dessicated coconut till it loses its color (15 – 20 mins approx) . Heat sugar in a pan. Add a small quantity of water and mix it till it dissolves. Add sugar syrup to the coconut mixture. Mix well till the mixture thickens. pour into greased tray and cut when cool. The picture above is of coconut malai burfi. It needs very simple ingredients and brings out the rich taste in coconut. Soak kaju and badam for an hour. Grind them with fresh coconut. Boil 1/2 lt full cream milk. let it simmer till it thickens. Add the ground mixture and continue to cook. Add sugar, elaichi and thicken. Once done, pour out onto a greased plate. Cool and solidify in the freezer for a few hours. Cut into desired shape and serve chilled. You can decorate it with fried kismis for that extra yummy look. You can use Nandini orange packet which is a good ‘full cream milk’ option. Please be careful while adding sugar to this dessert as coconut is an ingredient which is already quite sweet. This is what I call ‘Sankranthi Delight’. Fast to cook and great to eat any time of the day. What better way to celebrate the beginning of the harvest season? 1) Heat a thick bottom pan or a kadai. Add til seeds and fine rava. Mix in elaichi seeds and stir on low flame till both til and rava turn light brown (take care not to burn). 2) Add jaggery and mix well. Add 5 tablespoons of water, one tablespoon of desi ghee and continue to stir till mixture comes together. 3)Pour mixture out on a greased tray. Cut Til Rava Burfi into desired shape and serve once cool. 1) Preferably use jaggery of the brand ‘Dharani‘, available in all ISKCON temples. This tastes pure and you will not have to take the trouble of straining the jaggery to get rid of the suspended impurities. 2) Rava is used because til alone becomes too oily to eat. Also, rava gives the burfi a good thickness and consistency.